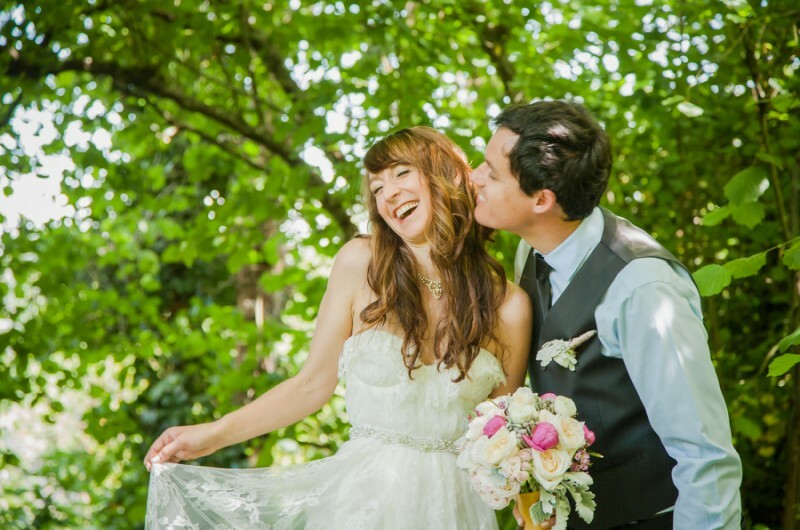 If there is anything that Kari and Eamon emanate through their wedding photos taken by Jenny Storment Photography, it is that they bring out the best in each other. Kari and Eamon tied the knot at Bhy Kracke Park with the backdrop of Puget Sound and Seattle followed by a cooking school reception (with, of course, a killer menu!). This is one of those weddings where you can see how much heart and soul the couple put into it, from the handcrafted details to the carefully written ceremony, and the results are absolutely inspiring. Kari and Eamon had a beautiful, touching ceremony, seamlessly integrating their loved ones into the traditions and blessings through a ring warming and passages read aloud by parents and siblings. Both Kari and Eamon incorporated oils and herbs into their unity ceremony that they felt best represented the love that they share. “Our uncle officiated and we wrote and planned everything. We wanted the ceremony to be personal, original and encompass who we are.” The vows that Kari and Eamon wrote for and read to one another, in addition to speeches and quotes recited by friends and family, were undoubtedly the most cherished source of happy waterworks for the couple on their special day. The couple explains they wanted a “white, clean look” for their wedding day, with hints of gold, black and light pink. To add a creative, unique touch to their floral design, Kari and Eamon arranged white and pink peonies in gold-painted mason jars, complete with ferns and crepe paper flowers crafted by the bride and her bridesmaids. To add to the personal and intimate elements of their wedding, Kari and Eamon teamed up to create sentimental DIY decor for their wedding and reception. The couple tells us, “Most of the embellishments were gold-framed chalkboards made by the bride, handmade wood table numbers made by the groom and flower arrangements.” Nothing like romance-infused crafts to bring you closer to your soul mate and best friend. Kari and Eamon celebrated their nuptials at Blue Ribbon Cooking School, so you know their reception had incredible food. “Having a seated dinner but allowing our guests to serve themselves was such a great idea. It helped encourage the tables to mingle more and it made the environment a little more relaxed and friendly. The great thing about hosting your wedding at a cooking school — we still get compliments about the food.” Kari and Eamon gave us the run-down of their menu and it’s so insanely mouthwatering. Thai grilled chicken skewers, marinated shrimp with champagne buerre banc, slow roasted salmon with blackberry butter sauce and wild mushroom risotto were just a few of the delicious plates offered. Did any lucky guests get to take home some leftovers? The support and love of their family can be found everywhere in Kari and Eamon’s special day … even in the dessert. “Our cousin is a former pastry chef and he made an assortment of wonderful tarts for the wedding. Everyone loved them!” Once again, Kari and Eamon put their handy skills to the test, adding their own personal touch by hand-making sea salt favors for their guests.